Heat oil in a nonstick sauce pan. Add onion, 1tsp salt, curry leaves & green chilly. Saute till onion turns light brown. Add chicken, saute for 1min. Add Vinegar, soya sauce, chilly sauce & tomato sauce, mix well. Chicken leaves oil after water evaporates. Add capsicum, stir for 2min. Keep stirring till chicken turns brown (roast) as you see in the photo. Spicy & slightly sweet touch Roasted Chilly Chicken is ready to serve. 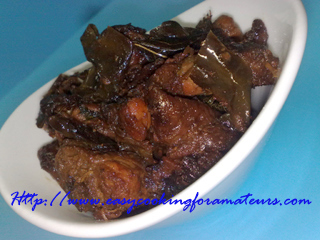 easy n tempting chicken recipe! THis must be great to drink with some cold beer. great !!! looks so delicious.. Thanks for making my cooking much more easier! Great recipe and looks delicious!